Every chef wants butcher block counter tops in their kitchen. You will never have to use a cutting board again! Butcher block adds warmth and timeless beauty to your kitchen. It can easily blend well with any design taste; from traditional to vintage to rustic to contemporary. Butcher block countertops are made out of thick strips of hardwood glued together to form one solid piece. Soapstone is widely used and is a well-known material for people living on the east coast. 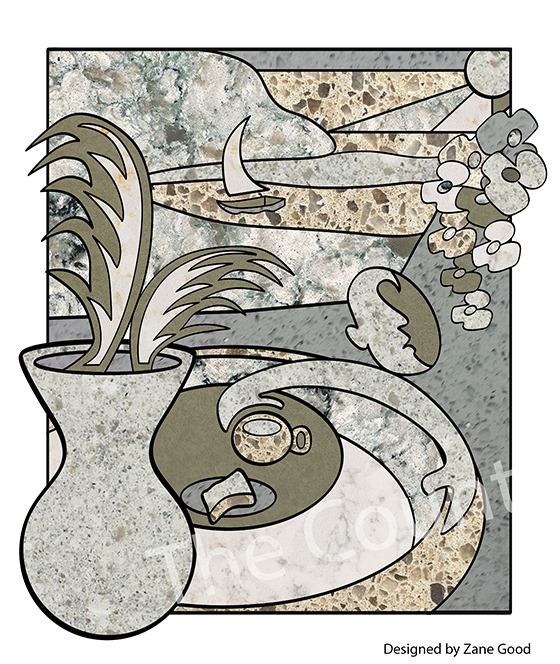 Many homes there have soapstone countertops that have been in their kitchen for over 100 years! Here on the west coast, many people don’t know much about soapstone and how great of a product it is, but most of us have seen it in our High School science class. Remember the black countertop the Bunsen burners sat on? Soapstone is a metamorphic rock that consists of talc, steatite, magnesite, quartz, and other magnesium rich minerals and it is quarried like granite and marble. We are happy to announce custom art inlays exclusively available through us. You can choose from our ready-made stock, or custom design your own. Call Zane at (850) 462-2781 to schedule an appointment today.